I’m predicting that this will be sold out in about 2.5 seconds. Rihanna is the latest global superstar to collaborate with MAC Cosmetics to create RiRi Woo, their cult retro matte Ruby Woo red lipstick “remixed” by the singer. The lipstick will be exclusively available online for $15 at maccosmetics.com beginning May 2nd. Get your e-shopping cart ready ;). Location: New York, working out of the fabulous Carlton Hotel. My style is: eclectic – I love a good sleek look but love bold color and patterns. I admire the style of that put together Parisian women but also love a bit of rock and roll. My favorite summer outfit includes my cute little pattern Rachel Roy shorts, a shirt I found at Barneys that said something “Caravan,” my Dolce Vita sandals, a great hat from Hat Attack, my Morrocan inspired necklace from Tiffany’s that my boyfriend bought me and a vintage silver ring from Istanbul I found at the Bazaar. I love and adore my Chanel and Lanvin pieces, and I am a huge fan of Nanette Lepore, Alice & Olivia, Cynthia Rowley and Clover Canyon. Some of my personal favorite pieces I own are by Walter as well – he has amazing pieces and some of my favorite dresses. I style my girls often: in Sachin + Babi who I love everything by, THEIA, Carmen Marc Valvo who has breathtaking gowns, Alice & Olivia; and for my guys, Ted Baker. For jewelry I adore Kira Kira. I try to support as many NYC designers as possible! Some that I love are Hunter Dixon, Synderla, Huminska, Dana-Maxx, Lotus Grace, Primary NY, YEOHLEE — the list is very long! Growing up, I really wanted to be: a ballerina. My best fashion advice: Don’t let the fashion snobs get you down! There are lots of velvet ropes in this world and I’d love to see fashion more inclusive then exclusive at times. Fashion is a way to show who we are to, to express ourselves and it is sad when there are things that stunt that. People usually compliment my: nails. 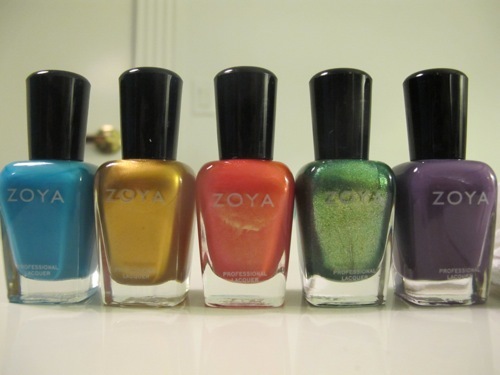 I have long nail beds and only use Zoya polish, but I also think I have nice hair thanks to Salon Grafix products. I love their conditioning cleansers and ChromaLogica High Gloss Hair Spray. I’ll never forget the time: I met Bono the night after his concert in Dublin and had the opportunity to tell him about one of my favorite companies, Wildlife Works– a company doing amazing things in Kenya. For my skin, I use: I’m in love with all products by DDF Skincare. My other skin regimen is juicing! I juice every morning, drink a ton of green tea and apple cider vinegar. I also take vitamins and eat a ton of chia seeds. My favorite place in the whole world is: I have a lot of favorite places but I would say France and Kenya but I also enjoyed Peru – I think they are all magical places. But I also can’t live without: Guerlain Samsara perfume – it’s been my scent for the last 20+ years. Worst habit: worrying. I worry a lot — I need to worry less maybe. 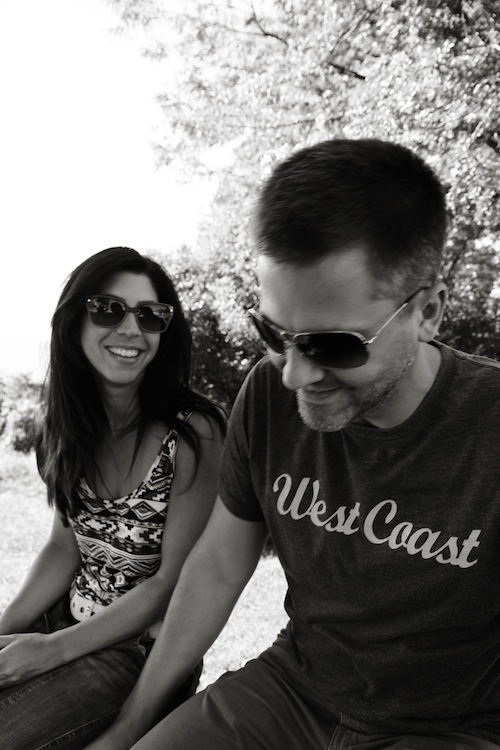 When I travel, I MUST have: my boyfriend by my side – I love travelling and exploring with him. My favorite scent right now: Samsara always, although I do love the scent we did with Demeter under Caravan. 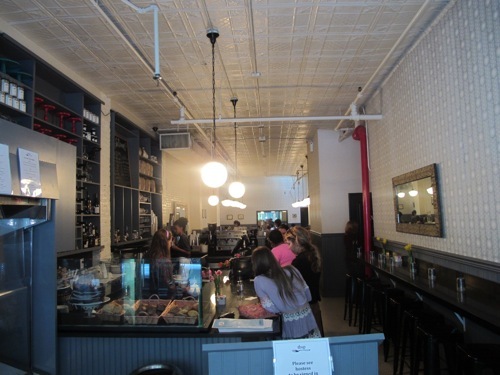 It’s a very cool concept built around scents found in the Fashion District such as cotton. People might be surprised to know that: I have two rescued dogs that I love so much – Noel and Barrett. Also, I’m a fan of The Carrie Diaries, True Blood, Game Of Thrones, House of Cards, and Revolution . My current favorite hair product is: Salon Grafix Conditioning Cleanser. I just love this collection! It’s affordable and rewardable. I don’t understand people who don’t like: Kale — if we are speaking of something nutritious. Otherwise, ice cream! I love ice cream so much. I joke that I cross fit just so I can have it. I love Baskin Robbins and Magnum bars. The restaurant I can never get tired of is: Cookshop because they are dog friendly and their food is so yummy. I hope in 5 years: I have a growing family; have written a book about how important it is to know that the future is ahead of you and that we are all created to be ourselves and love ourselves and help each other (this comes from a very personal experience); and have a film based on my book! Also to become an admired stylist and brand strategist. Who inspires me: I will always say the people closest to me – my parents, my boyfriend, even my little dog who just underwent two surgeries and was a little fighter. The people who really inspire me are the people I know who get up in the morning and help each other — who try to be the best individuals they can and who support one another. It’s important to constantly be inspired! I’m ashamed to admit that it’s been a while since I’ve tried a new place for brunch in the city. Usually, I’ve been sticking to the most convenient options for me (Eatery in Midtown), or the no-fail ones (Cafe Mogador in the East Village). It’s so nice to break out of that routine though, and upon the suggestion of my friend Sadia, we found another gem: Spoon. 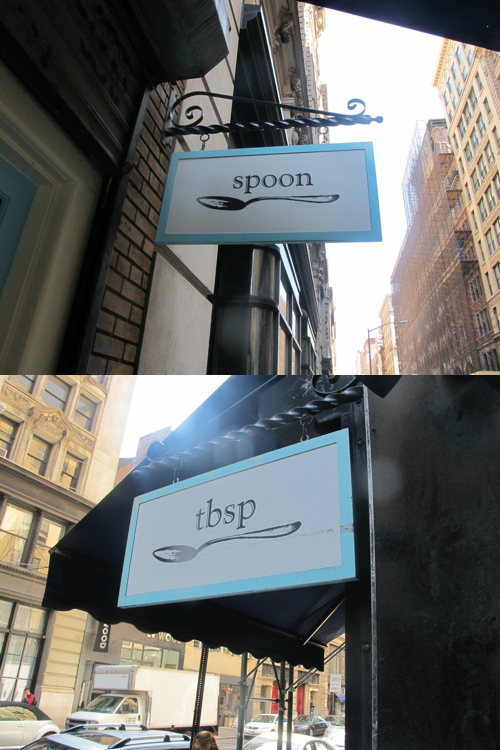 Spoon is the name of the family-owned restaurant, but they also have a takeout storefront they refer to as Tbsp (so cute). The space is so cozy and feels like you’re eating in a country house (perhaps the point — owner Melissa Chmelar credits her mother’s country cooking as inspiration for most of the dishes). The farm-to-table concept results in really fresh, really delicious plates with seasonal organic produce delivered daily from upstate NY. We didn’t get to try too much of their sweet options (even though they sounded amazing — cinnamon brioche french toast! 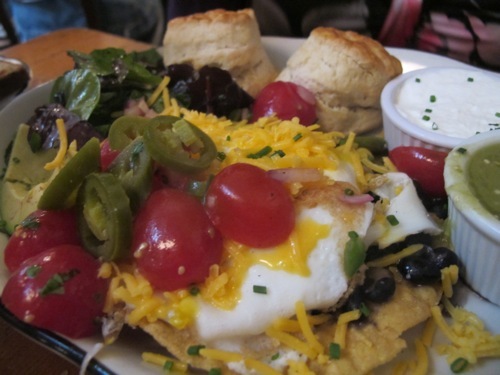 ), but the eggs made all different ways were insanely good. 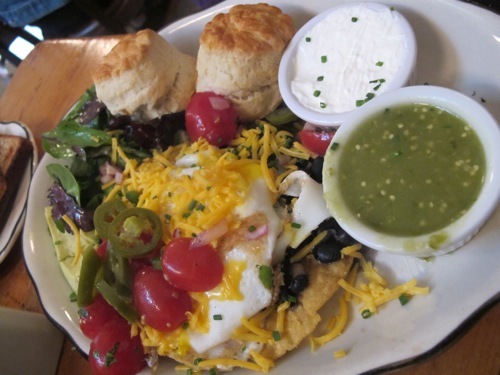 Huevos Rancheros ($14): Corn tortilla with two lightly fried eggs, black beans, tomatillo salsa, crème fraîche, cheddar cheese served with a buttermilk biscuits. It never ceases to amaze me how many different variations there are of huevos rancheros but this was definitely one of the better ones I’ve had. 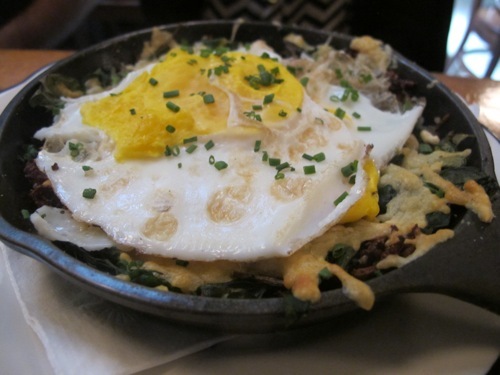 Baked eggs in a skillet ($12): Herbed Shitake mushroom and Russet potato hash, (option to get it with house-seasoned pork sausage…we got it without), fresh spinach, 2 eggs and a crisp Parmesan crust with whole grain. Think this might have been my favorite but a tough call because I really loved all the egg dishes for its own reasons. Eggs Espana ($12): Pan tomate, shaved Manchego cheese, 2 perfectly poached eggs, and fresh pico de gallo served with seasonal greens. 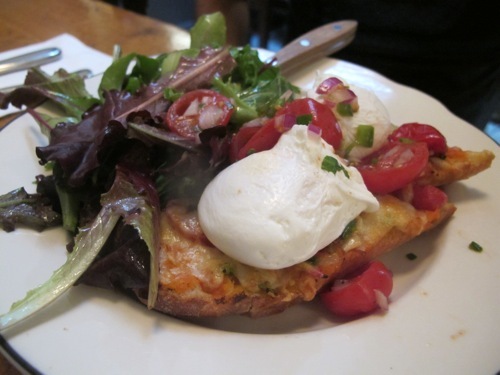 Has a bit of a pizza taste to it (can’t complain about that for brunch!). 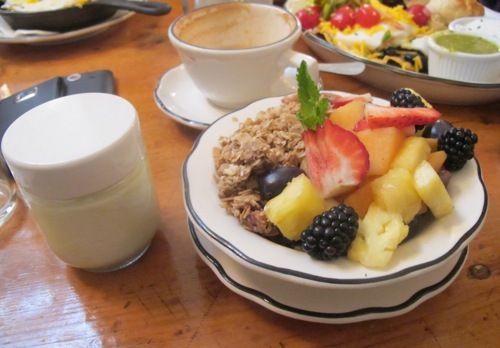 “Best Ever Granola and House-made Yogurt” ($9): This is Spoon’s self-proclaimed best ever granola with house-made yogurt, fresh seasonal fruit and a wildflower honey drizzle. Don’t think I remember any honey on ours, and I can’t agree that it’s the best ever yogurt and fruit I’ve had. The yogurt itself was presented in a separate jar (points for creativity), and was invariably fresh but think it would have sold me more if it had more berries and wasn’t such a mess to mix with the overflowing bowl of granola. 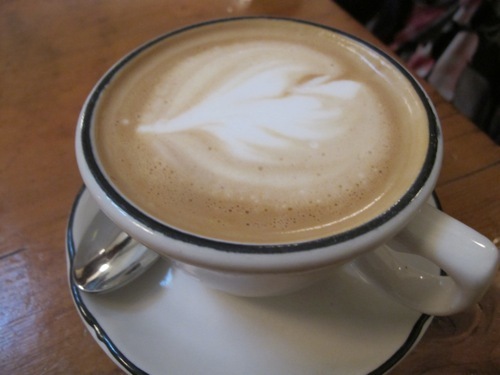 Did I mention they serve Stumptown coffee here too?! Unfortunately, doesn’t come with the baristas from the neighboring Ace Hotel. I should also note that this is a pretty nice option if you have kids you’re bringing along — they considered the little ones and have a “tbsp” menu for them too! Namely, grilled cheese, pb&j, and eggs with chips. Will be going back again for sure. As a move towards more healthier menu options, McDonald’s just launched their new, 250-calorie Egg White Delight McMuffin this week. To help celebrate the launch, the company enlisted 17-year-old gymnast and two-time Olympic gold-medalist Gabby Douglas — an appropriate “flipping” partner and longtime McD’s patron, interestingly enough. Beauty and the Feast: How did you decide to partner with McDonald’s? Gabby Douglas: I’ve loved McDonald’s since I was little. I was always a big fan, especially now that they just came out with their Egg White Delight. For me, I’ve always loved egg whites — it’s a great source of protein and this just tastes so good. BATF: Do you have a particular McD’s menu item that you’re partial to? Douglas: I was always obsessed with their McFlurries! I still am. I mean ice cream and M&M’s – I’m in heaven! And to be honest, right after the Olympics, I went straight to McDonald’s and got an Egg McMuffin. BATF: When you win the gold at 16, what’s next? You’re already at the top. Douglas: One of my goals is definitely to go back and defend my title. Do it all over again. Just getting back into the gym. I start training again in May. BATF: I read that you left home to start intensive training in Iowa. At what point did you know that this is what you’re meant to do? Douglas: I knew since I was little that this was it. If you have a dream, that’s just what you have to do. Douglas: My advice is just fight for your dreams. I’m so honored and blessed to be in a position where I can help girls pursue their dreams and tell them to believe in themselves. If you do that and you have confidence in yourself, you can achieve anything. BATF: What did you think the moment you realized you won? Douglas: I just thought about all the hard work and dedication I put into the sport. It was all worth it and I’d do it again in a heartbeat. BATF: What are some of the sacrifices you had to make to focus and be the best? Douglas: If you want to be the best, it’s really going to cost you. You have to make some sacrifices for sure. For me, it was not going out with my friends, the movies, not going to prom, not being a regular teenage girl and having a boyfriend. One of the biggest sacrifices was moving away from my family. But in the end, it was all worth it. Meeting Gabby Douglas at McDonald's in Times Square! BATF: I’m sure a lot of cool opportunities have been coming your way. What were some of them? Douglas: Meeting my fans and the celebrities. The fans are awesome! They always say very kind words to me. Yesterday, I went undercover and flipped in Times Square as a surprise [to promote the launch of the new Egg White Delight McMuffin] It was so fun – no one was expecting it! BATF: You mentioned celebrities – were there any who you were particularly thrilled about meeting? Douglas: The cast of The Vampire Diaries! I love that show. Meeting Ian Somerhalder and Nina Dobrev was exciting — they were so sweet. BATF: Part of my blog is beauty, so I wanted to ask: what’s the one product you can’t do without? Douglas: Mascara. I cannot live without CoverGirl’s mascara! 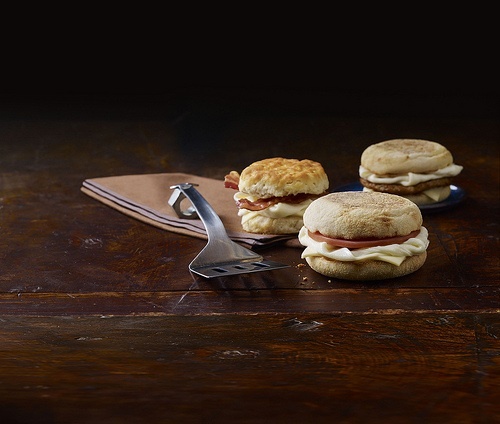 The Egg White Delight McMuffin ($2.69) as well as the option of freshly grilled egg whites with white cheddar on any egg and cheese breakfast sandwiches are now available at McDonald’s nationwide. Thanks to Gabby Douglas for her time and McDonald’s for organize the interview! 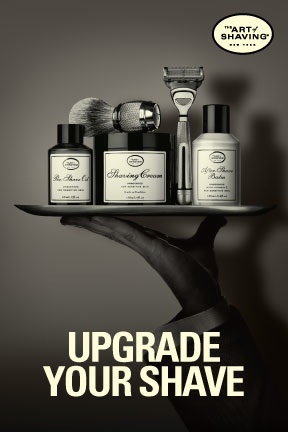 Just an FYI: The Art of Shaving is partnering with Bloomingdale’s to challenge men to upgrade their shaves on Saturday, April 27th from 10am-10pm. All you have to do: Bring your current shaving cream into Bloomingdale’s locations nationwide and The Art of Shaving will exchange it for The Art of Shaving 2.5 oz. Lavender Shaving Cream tube (worth $14). And, if you spend $100 or more on their products, you’ll also receive an 8-pack of razor blades. Not a bad deal. 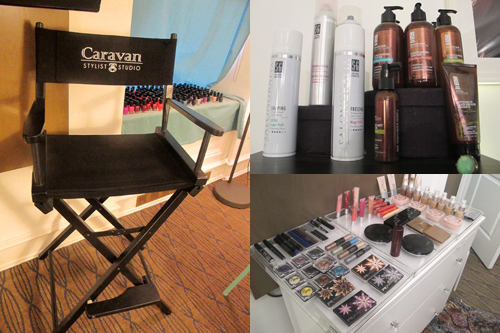 This was something new: I was invited recently to check out the exclusive Caravan Styling Studio, which is discreetly tucked away on the 2nd floor of the luxurious Carlton Hotel. Their services are mainly reserved for celebrities, musicians, editors, and bloggers (hi!) to come together with designers and photographers to be styled and made up for events and special red carpet appearances. I went last week just to see what they were about and when I met Valerie Star, she asked me if I wanted my nails done. 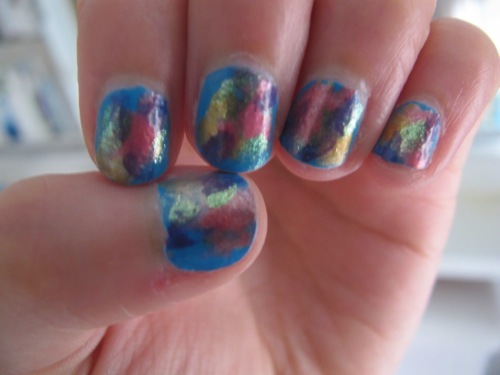 This is when I had to reveal my biggest beauty blogger faux pas: my nails are entirely neglected. Since I joined a basketball league a few months ago, I have to cut my nails so often because they keep breaking during my games. As a result, they’re down to being little stubs that I rarely paint. Somehow, this didn’t deter Valerie (who also happens to be a painter). 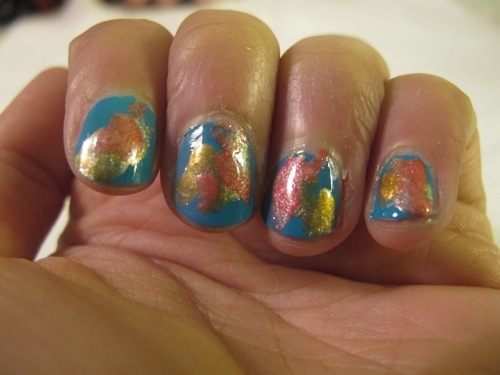 She said she wanted to do a fun spackle design: “I call these party brunch nails.” After seeing her own creation, which we decided to name “Burton-chic,” I knew she’d be the best one for the job. Tim Burton-chic. 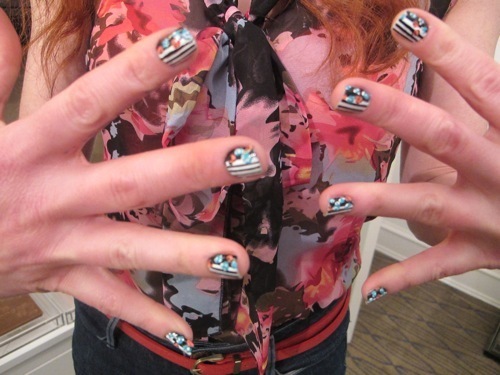 She changes up her own nails with intricate designs twice a week! She promised they’d last til my next bball game so I let her paint away. 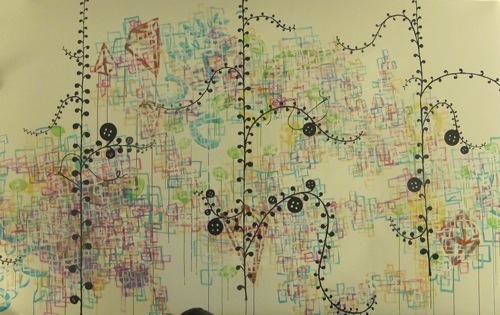 This is one of those designs that I think would be easy to replicate at home. 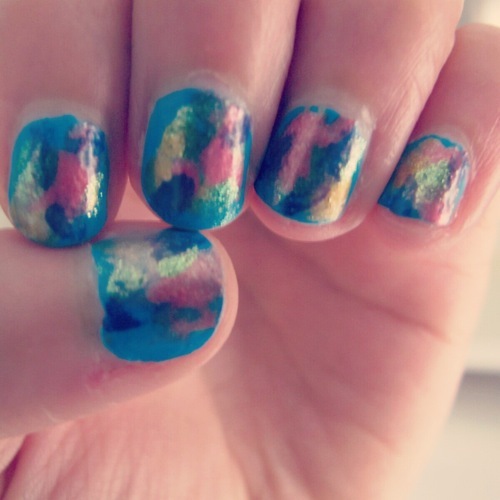 Here’s how she achieved my nail art design above. 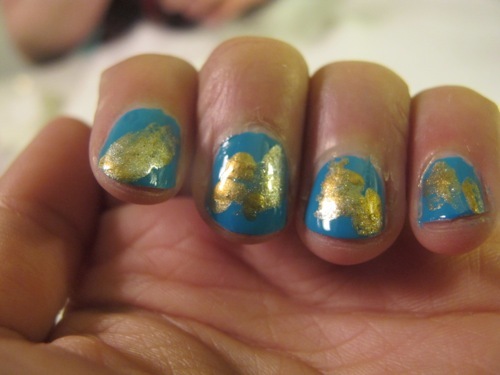 Step 2: Rip a makeup sponge and use one of the jagged edges to dip into the next color, Zoya’s Goldie. Dab over the blue polish sparingly. Step 3: Repeat with a clean edge, this time dipping in Zoya’s Ginger. The best part about a design like this is you can have fun with colors and try a bunch of different combos for a completely different look. Have fun!